How Do I View My Store's Not Completed Orders? 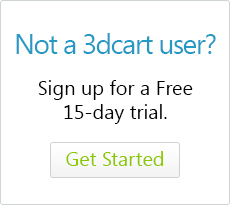 3dcart keeps tracks of orders from the time that a customer adds a product to their shopping cart, all the way to the last page of checkout. This allows you to keep an eye on where/why customers decide to stop shopping on your store. Before we continue, it's very important to understand that when it comes to e-commerce, it's very tough to get a 100% conversion rate. That is, everyone that comes to your store will not necessarily buy. It's very common that someone may add things to cart, check shipping rates and leave. Your goal is to try to convert as many customers as possible, so you want to look at where customers stopped shopping to see what can be changed to make their experience better. This is why we made not completed orders visible. A tool was created to contact customers with not completed orders; we recommend that you use this tool often. The tool emails customers with their order details, and a link that can be clicked to complete the order. Customer added 1 or more items to their cart. As of Step 1, we have very little information, we only know what the customer added to their basket, and unless they are an existing customer and have logged in, we have no idea what their email/phone/contact information is. By Step 2 however, we now have their email, possibly a phone number, their name, and address. Step 3 gives us an insight on what shipping method they selected, did they select NEXT DAY? Or did they select GROUND?, where they looking for the cheapest or the fastest way to get the product? Step 4 means that they where happy with everything and tried to pay. If the order is still not complete it's because they were never able to complete the transaction. Perhaps they found no balance on their Paypal account, or their card was declined. Based on the information above, we know that starting at step 2, the customer had some interest in your product, and if they didn't checkout, you should contact them and offer them your help to complete the transaction. At Single Checkout, the customer has reached the checkout page. Email address, phone number, shipping information, and billing information may be present, depending on how much of the form the customer has filled out. Based on the information above, we know that starting at single checkout, the customer had some interest in your product, and if they didn't checkout, you should contact them and offer them your help to complete the transaction. Once you review your email template, you can continue to the next step. 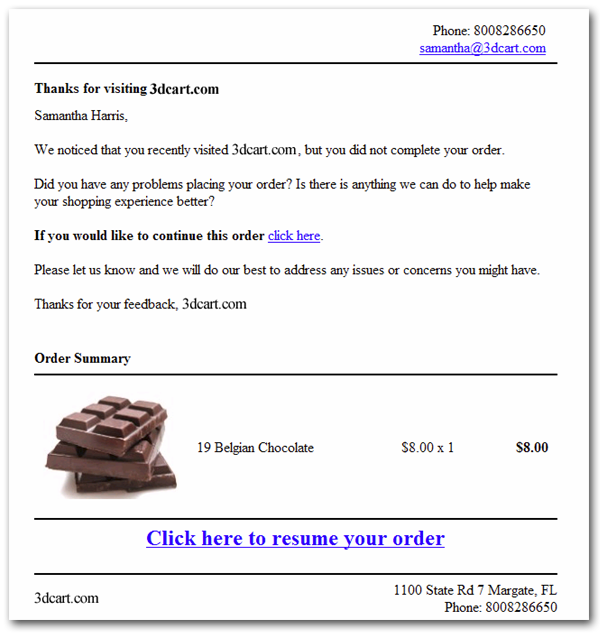 The email template contains order information such as the items the customer added to their basket, and shipping options (if they had selected one), as well as a link they can click in order to complete their order. Check the checkbox if you want to send an email to ONLY those that have not been emailed yet. Choose timeframe in which the customer left your site for whom you would like to send the email to. The order must be in Step 4 for this option to be available, as step 4 of the process is when the order is given an invoice number. Move the Order Status from Not Completed to Unpaid. If you have already received payment for this order, this process will not charge the customer a second time – you are simply moving the order from one status to another. Once done, move the order from Unpaid to the New status for processing.